Compact in size, being a fully equipped RGB laser display system with inbuilt burst effect and 3W white LED blinder - that’s Kvant Burstberry. Allowing you to create a new types of effects never seen before. With our new Burstberry you can now easily create all the super-cool laser effects that seemed impossible to accomplish before. Controlling a complex setup made of many Burstberries is now so simple thanks to the control via ArtNet and DMX protocols. The system is designed to work as a multi-head laser system and can be assembled into virtually any geometrical formation. Individual units can be physically clipped together from 6 different directions, which makes it possible to create more or less any kind of shape you can imagine. Im folgenden Video wird das Burstberry System auf der Bühne eingesetzt. Kurz vor Auslieferung werden alle Kvant Laser vom Qualitätsmanagement überprüft. Dabei werden unter anderem die Ausgangsleistungen der einzelnen Lasermodule gemessen und auf dem Zertifikat vermerkt. 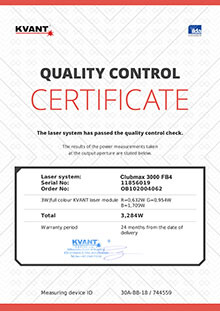 In Sachen Showlaser Sicherheit hält KVANT LASER bei allen Showlasern höchste Standards ein und entspricht somit immer den aktuellsten europäischen Normen ( z.B. aktive Strahlüberwachung, mechanischer Shutter, Pangolin Lasorb, Remote Not-Aus, Schlüsselschalter ). Die Laser der Kvant Logolas Serie wurden vom deutschen TÜV Süd nach EN 60825-1 und IEC 60825-1 geprüft. Ein entsprechendes Prüfprotokoll liegt selbstverständlich vor.